When it comes to great home cooking, herbs are the key to separating the ho-hum for the UH HUH! And when it comes to great herbs, fresh beats dried hands down. Fortunately, it’s not hard to grow your own, doesn’t take much room, and is well worth the time and money needed. You do not need to make this a fancy or expensive venture, but you can get as elaborate as you like. Let your imagination be your guide on a cold weekend and have some fun: All you really need is a decent sized pot, some potting soil, and a few seeds or starts. You should also have a nice sunny spot, of course; herbs dig direct sun and warmth, just like us. You may want to go to a decent nursery to find a decent selection, and your chances are better for finding starters there, which have obvious speed of enjoyment benefits over seed. 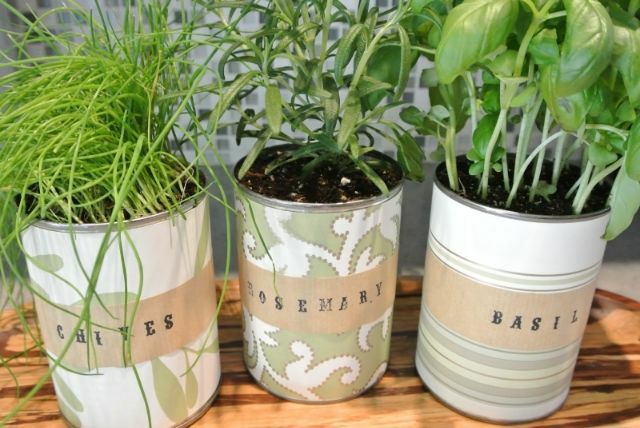 Choose a variety of herbs that you like to use most. The five choices I opened with are our faves, but get what floats your boat; nowadays, you’ll not just find thyme, for instance, but varieties like lemon, lime, or lavender. Same goes for Basil, Oregano, Sage, Marjoram and a bunch more great herbs. Buy a large, deep plant pot, 12″ to 18″ around and a good 8″ to 12″ deep. Keep in mind the growing habits of your choices when you select pot size; sage grows tall, basil and oregano fairly bushy, while thyme is a creeper. Make sure its got drainage holes in the bottom and buy a nice deep saucer to handle runoff. 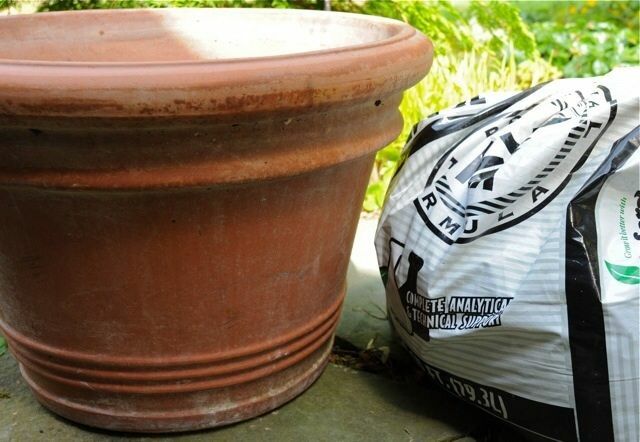 Get a bag of decent quality potting soil big enough to fill your pot and have some left over. 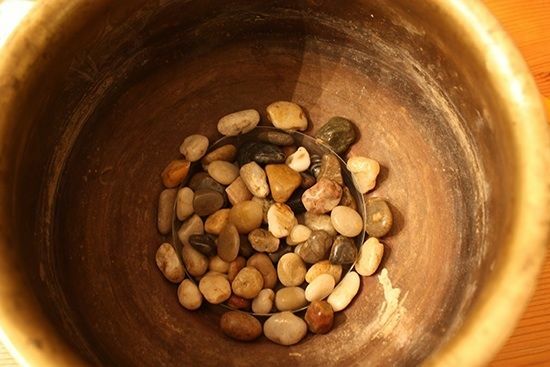 Scrounge some gravel, river rock, or pot shards to line the bottom of your pot; they’ll aid in drainage by making sure the holes don’t get clogged with soil. When you get everything home, fill the pot up with soil, stopping about 3″ inches from the top. Moisten the soil lightly but thoroughly and mix it well by hand. If you bought starters, make your holes about 1 1/2 times the size of the soil the plants came with. Gently pull the plant from its container and carefully loosen the soil around its roots. Don’t tear the roots, just give them some breathing room. Plant your starter, pack about 1″ of your potting soil over the dirt and roots and press everything down gently but firmly. Give each plant a couple of inches room from each other. Water thoroughly when you’re finished planting but don’t drown the little guys. If you’re planting seeds, follow the directions for starting them, as to depth, water, germination time, etc. 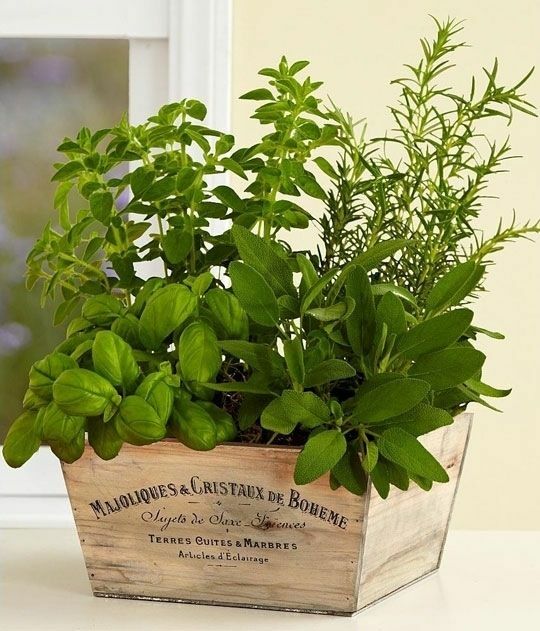 Set your pot on its drainage saucer and pick your best growing spot; again, most herbs like full sun, and in the cold months, they’ll take as much of the weaker weak winter sun as they can get. Don’t overwater; when your little buddies look parched, (droopy dull leaves are a sign), give them a nice drink. You do not want the soil saturated, nor should there ever be standing water in your drip tray. You can certainly give them a little plant food if you like. We find that herbs dig Superthrive, which is a great, well established growth supplement. Speaking of growth, keep an eye on that and trim as needed for meals and to keep things fair in the jungle. 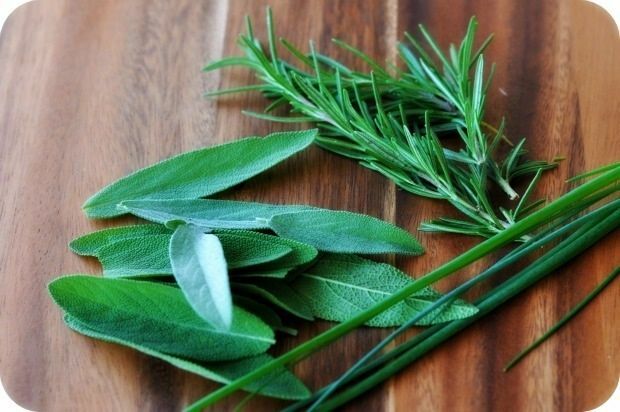 When you want some herbs for cooking, cut top leaves first. If you trim to a junction rather than just in the middle of a stem, you’ll encourage better health and regrowth. Once it gets warm again, you can set plants outside or leave them in as you see fit. Personally, the closer the ingredients to the pot, the happier I am.